You are invited to the first of two days of public meet ups and workshops to exchange ideas and explore the DIY networks of Deptford Creek. We welcome MAZI partners from around Europe to meet friends and contributors in SE8 and beyond. Creeknet is one of four MAZI pilots, helping people face local challenges together, supporting network development, sharing resources and promoting sustainability. We begin at the Hoy Kitchen with introductions to Creeknet and its DIY networks. Meet visiting MAZI partners from Zurich, Berlin and Kokkinopilos. Deptford artists present photographs of the area and describe their experiences living and working locally. At lunch, we re-open the historic Hoy Steps and cross the Swing Bridge, before drifting to the Creekside Discovery Centre for a low tide walk at 3pm, then examine new species monitoring and environment sensing installations. 10:00-10:30 | Welcome : Come along and hear about Creeknet and its contributors, the MAZI project and what it is trying to achieve for DIY networks anywhere. 10:30-11:30 | Orientation : Find out about how the MAZI pilots are engaging with their local communities in Germany, Switzerland, Greece and UK. Discover where Creeknet is already active and help identify where more support is needed. 11:30-13.00 | Discussion : What do social cohesion, conviviality, knowledge sharing, and sustainable living mean? We want to know your perspective and explore how DIY networking could help our local communities address these challenges. 13.00-14.30 | The Hoy Steps are from a time of industry on the Thames. We’ll be reopening the steps as a reminder of the history and river access that still remain in the area. The Creeknet app is being used to create an ‘Anchorhold’ trail that presents a selection of local publishing options or environment sensor controls that can be activated to report on changing conditions. 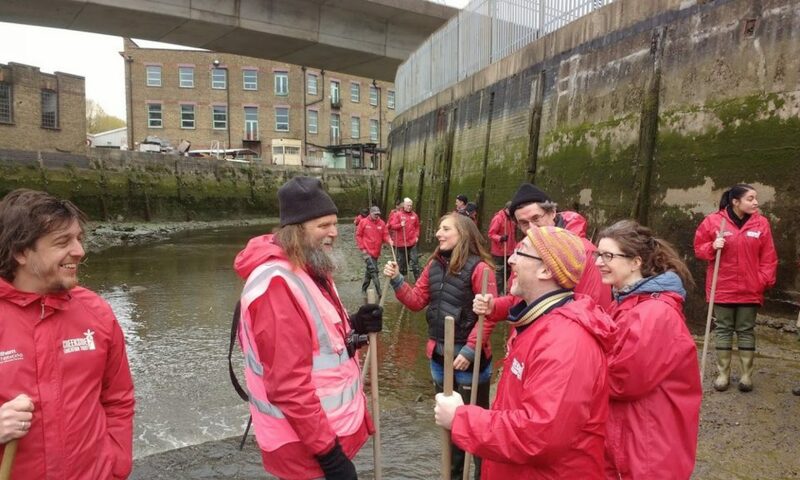 Visit Deptford Creek at water level. Extend your senses as we explore the river environment and ecology. Please don’t be late as “tide and time wait for no man” ! 17:00-18:00 | Tea and Cake for all the happy wanderers – Species monitoring and environment sensing the creek.